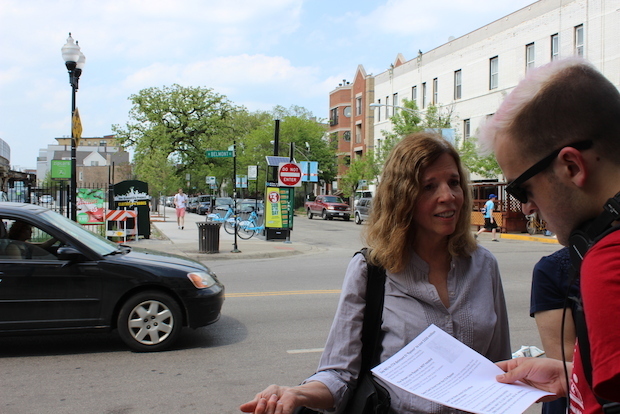 LAKEVIEW — The recent Wilton Avenue residents meeting with CTA officials was the first time resident Ellen Hughes called somebody a liar to their face, she said. It was to a team of CTA officials, including the authority's president, Forrest Claypool, and it was over the amount of time that could be saved with a proposed plan to build a new track at the Belmont "L" station, colloquially called the Belmont bypass or the Belmont flyover. CTA said trains were delayed up to four minutes due to the layout. Hughes said she — and others — have timed it, and most trains only experienced 20- to 30-second delays. "They were saying everything is fine. That it’s progress," Hughes said. "We had been saying to them, 'You're lying about the four minutes'." Now, Hughes, neighbor Terri Hanley and others are passing out fliers by the station, sending out emails and visiting local businesses in hopes of rallying support against the project. They hope that a critical mass of people will attend Thursday's open house at the Town Hall Police Station, 850 W. Addison St., from 5:30-7 p.m., to fight the project, which they say isn't worth the money or the potential impact to local streets. "At one point, they said: 'We can have a difference of opinion'," Hughes said. "It's not opinion. It's facts. We're trying to get facts out so that people will care." The CTA has said the average delay caused by the Clark junction is about 84 seconds — with some delays lasting as long as four minutes. The $320 million project, which could potentially be funded with federal grants, would solve delays by building a track over the current three tracks. At the root of the issue: To complete the project, the city needs to acquire 16 buildings, partial air rights on two buildings, a vacant lot and two parking lots — including several mixed-used buildings on Clark Street and five residential buildings on Wilton Avenue. The amount of time saved by building the bypass, some neighbors said, is not worth turning Clark "into an under-'L' wasteland." But the bypass is about more than saving time, CTA spokeswoman Tammy Chase said. Red and Purple line trains already are serving as many riders as they can, and without the bypass, the CTA cannot add more trains. If population trends along the North Side corridors continue, trains will be more crowded, more people could end up driving, and the city's overall quality of life would be degraded, she said. With the bypass, the CTA could add six to nine Red Line trains and six to eight Brown and Purple Line trains per hour, or at least an additional 7,200 riders, the CTA said. "This is not about three to four minutes," Chase said. "This is about six to eight decades of investing in the future. This is about enough train service in the future." Hughes and her supporters said the talk about capacity is simply a more vague way of discussing the project to confuse the public. It's misleading, much like with conceptual renderings, which paint a rosy picture for what will actually be a desecration, they said. CTA's images of the junction, such as this one, show buildings that don't exist — a false promise since the CTA would not be building those developments, neighbors argued. "This is unbelievable, if not an outright lie," Hanley said of conceptual renderings. Chase said the renderings, by their nature, must show buildings that don't exist. They were created by architects and engineers based on current trends in Lakeview development, such as multifamily homes and retail buildings, Chase said. 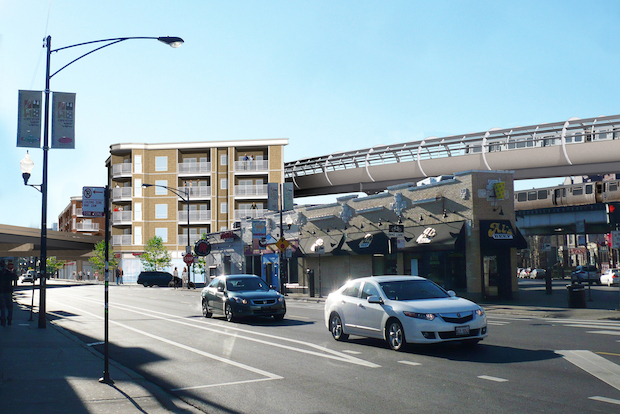 Though many neighbors said the flyover's construction will destroy Clark Street's landscape, the CTA believes Lakeview's "vibrant" real estate market will continue after the project finishes, Chase said. "There is no evidence that suggests that decades of trends would be reversed after CTA makes this investment to improve transit," she said. "There’s no validity to that argument." Neighbors on Wilton Avenue, a block near the tracks, are wary of trusting the city. 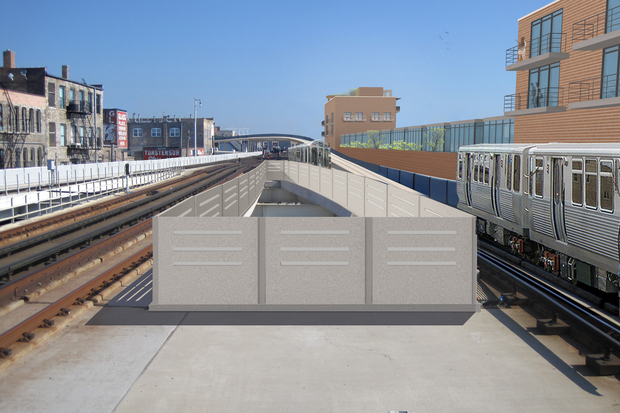 CTA has said the project's not a done deal, and neighbors hope to convince enough other people in the neighborhood that it shouldn't be one. "To me, it’s about more than my property," Hughes said. "It’s my neighborhood. When I walk outside, I want a world to be there."